When Minnesota dentist, Walter Palmer illegally poached a protected lion in Zimbabwe’s Hwange National Park in July 2015, it quickly caused a firestorm of outrage on social media as well as the media at large. Never before had the world seen such a reaction to a poaching incident. The public’s fervor seemed unstoppable. I watched in bewildered amazement as the world bathed in the blood of collective righteous anger over this thing. I have taken to animals since boyhood, my first true disappointment in life being the realization early on that so many people are just flat out cruel and uncaring towards other living things. I had to see that dentist’s stupid face over and over again, posing with a veritable Texas Chainsaw Massacre-style menagerie of the dead. I had to keep seeing his bespectacled visage staring back at me. His bald, bowling ball head, dumb under the African sun with glow-in-the-dark teeth. He was either the guy they beat up in school or the guy who beat people up or both at different times in his life. The outrage, though justified, had me confused. “Why now?,” I thought to myself, scrolling through endless images of this trash on my Facebook feed. As part of the animal rights community, I see tons of stuff like this every day. Ted Nugent makes frequent appearances with arrows through the heads of gophers and other assorted Animalia. People with something to prove posing next to dead giraffes, some guy with high blood pressure and a face that looks like a leather bag full of gravy posing next to a bear that never did anything wrong. I see this every day. What was so special about this lion? Why all of a sudden? I enjoyed that people cared so much. It gave me hope and made me nicer to people, but why now? It was because this had been no ordinary lion. This was Cecil the lion and Cecil was an animal celebrity, a local favorite at the park and a major attraction. The story of the animal celebrity is far from new, but it is frequently tragic. P.T. 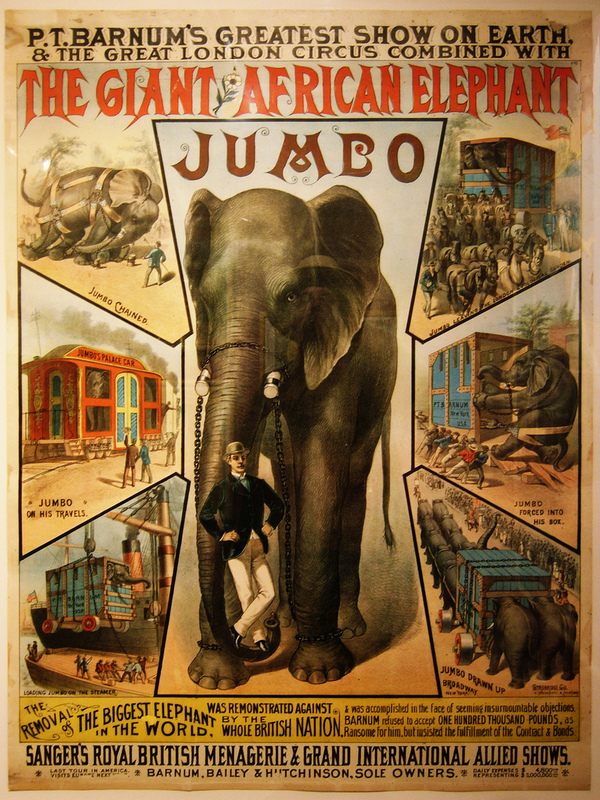 Barnum purchased Jumbo, a male African elephant, in 1882 from the Royal Zoological Society in the UK for $10,000. A parade was held for him when he arrived in New York. This was a big deal, after all. P.T. Barnum was a master exploiter, but he needn’t work too hard with this one. Jumbo was already famous and the noise and chaos filled the air as the gargantuan pachyderm was paraded down the street in the front of the eyes of gawkers and the stench of the city. Everyone yelling everywhere, dropping garbage all over the street. For Jumbo, this was just another step in a long, arduous journey. It’s hard for us to realize just how famous Jumbo was back in his heyday. He was quite literally a household name and still is, though many of us may not know it. When we use the word jumbo meaning something large, we’re referencing Jumbo the elephant. The word had not entered the English language until after he had become popular. Jumbo’s mother had been killed by Arabian hunters and the infant Jumbo was captured to be sold in 1862. The hunters were under contract with a Bavarian animal dealer to capture juvenile animals for export to zoos and menageries. Jumbo was one of hundreds of all kinds of species of megafauna that were arranged in a rough caravan of antelope, camels, rhinos and of course other elephants, trekking through the desert for over a month for hundreds and hundreds of miles under the blistering, unrelenting sun. Many animals died, but Jumbo kept on. After the tedious desert trek was over, it was time to board a series of ships. Jumbo survived the suffocating voyage in the hull of a steamship, while many more animals died. He went off and on many different ships; 300 hundred miles on one ship, 200 miles on another. He endured the sweltering arcade of misfortune until finally reaching Austria where he was loaded onto rail. He arrived in Germany but was soon sold off to the menagerie in Paris, the Jardin des Plantes, where he lived in the Rotunda for Large Herbivores. Jumbo lived in the menagerie with two other juvenile elephants called Castor and Pollux, though Jumbo largely kept to himself. He did not like crowds. Upon inspection, government officials deemed the living conditions in the menagerie to be unsuitable. Jumbo had been malnourished and covered in filth, his nails untrimmed and dirty. Instead of paying for upkeep, he was sold off to the London Zoo. Five years later, all the animals in the Paris menagerie – including Castor and Pollux – were killed and eaten during the Franco-Prussian War. Jumbo stayed on at the London Zoo where he grew stronger and healthier and learned how to deal with crowds. He damaged his tusks permanently, dealing with a life in captivity, grinding them everywhere, wearing himself down in the enclosure. His stable gave him anxiety and he would frequently fly into a rage when put there. Mathew “Scotty” Scott, the keeper in charge of care for Jumbo, started to form a deep bond with him. He would often fly into a rage when Scotty would go home for the night. Scotty would often spend his holidays and days off with Jumbo for fear of his freakouts. Jumbo’s molars had been erupting abnormally, causing him to have severe tantrums. The superintendent of the London Zoo grew contemptuous over Scotty’s relationship with Jumbo. His freakouts had become more frequent. The elephant stood 12 feet tall and weighed 7 tons. His tantrums were an exceptionally frightening spectacle. He was seen as a liability. The superintendent began to look for a way to sell him off. That’s when P.T. Barnum came knocking. The deal was done quickly and in private.Barnum knew exactly how to exploit the publicity associated with Jumbo. 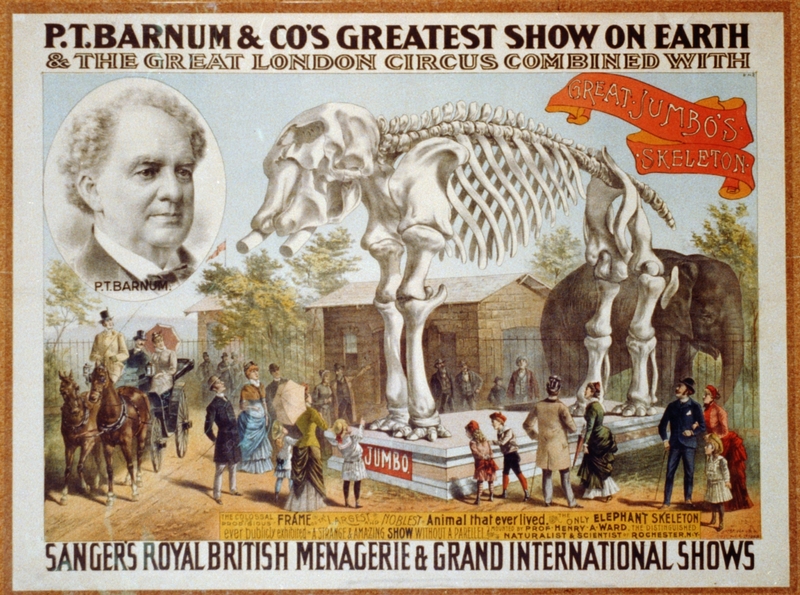 Barnum forbade photographs in favor of official promotional illustrations so Jumbo’s size could be exaggerated. 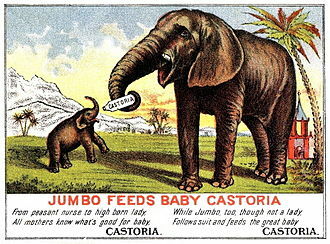 Though it appears Barnum didn’t have the sense to capitalize on Jumbo’s image, which was used to sell everything from laxatives to toys to vegetables. Scotty stayed on with Jumbo through the move to the US and would sleep close by him in a bunk over by Jumbo’s head in his traveling car. They would share a bottle of beer every night before going to bed after the show. He stayed in Barnum’s circus for years, forced to give rides to patrons over and over again. After four seasons in the circus, the stress of constant travel and lack of dental care to his molars meant he would soon starve to death. 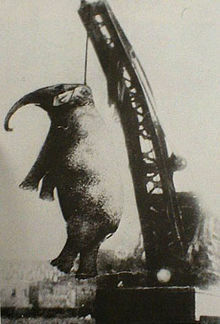 On Spetember 15th, 1885, when Jumbo was 24 years old, he was killed either by accident or on purpose, you could never tell with Barnum. 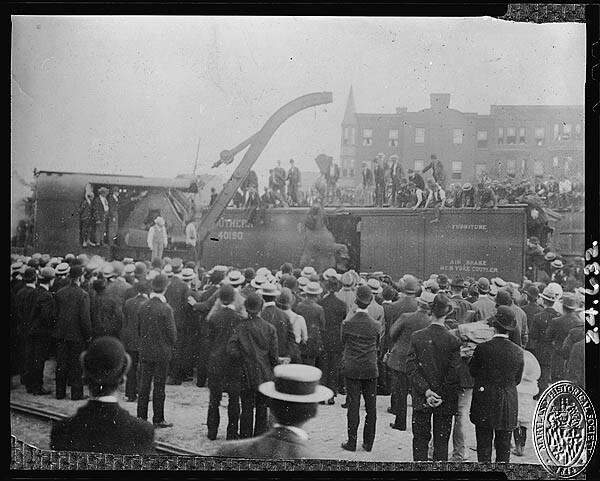 The elephants were being loaded across the rail yards to their boxcars when an apparently unscheduled freight train came speeding down on them. Jumbo and a dwarf elephant called Tom Thumb were hit by the train. Tom Thumb broke his leg, but survived. Jumbo saw the train coming and ran away from it down the track with Scotty beside him. The train hit Jumbo from behind. He became wedged partly above and partly below a flatcar, roaring out in pain. His skull was fractured and blood pouring out of him. There were people who claimed he held onto Scotty’s hand with his trunk before dying on the scene. Barnum called a publisher three days after the incident to see if a children’s book could be published about the event for a Christmas release. He also lied to journalists, claiming Jumbo saved both the dwarf elephant and Scotty. Jumbo’s tusks and other body parts were broken up and sold as souvenirs. His bones and stuffed hide toured with the circus for years. 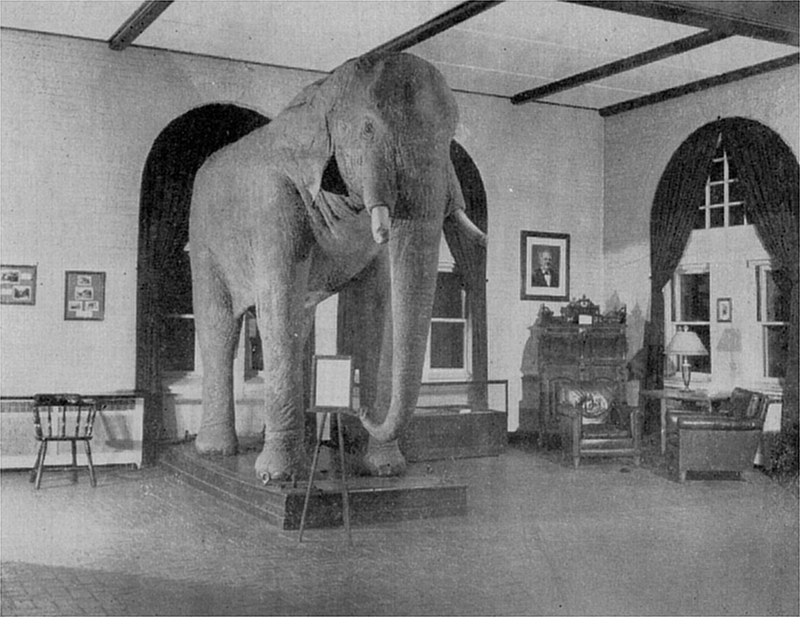 The hide was finally gifted to the Barnum Museum of Natural History at Tufts University until it was destroyed in a fire. The mighty, famous beast, dying for our sins. One of the most absurd, outrageous stories of circus animal cruelty in the modern era is that of the hanging of an elephant called Mary. It happened on a bleak afternoon in September 1916. Mary was featured in Charlie Spark’s Traveling Circus, performing tricks, sitting unnaturally on her haunches, standing on her head and doing it all over again the next day, day after day after day. On September 12th, Mary, like Jumbo before her, had been suffering from a painfully abscessed tooth. She was made to perform stupid tricks for a gaping audience, pitching baseballs and tooting horns. Tennessee at this time was no stranger to hangings. Between 1882 and 1930, there had been 214 lynching victims in the state. These of course were mainly black men who had most likely done nothing wrong but were found guilty by an angry, evil and ignorant mob. A hobo called Walter Eldridge had just got a job with the circus a day or two before. The 38-year-old had zero experience working with elephants. He was given a large bull hook or “elephant stick” as it was called at the time – a big stick with a sharp metal blade at the end. He was instructed to beat her with it if she got out of line, to keep her in check. Eldridge rode in on Mary when the circus came to town in Kingsport, Tennessee. The abscessed tooth was getting the better of her. There was a dirty piece of watermelon on the ground. You have to remember that these are the days before people ate a ton of processed junk food, so instead of Cheetos and Snickers wrappers, you would find a lot of watermelon rinds and orange peels. Mary had been leading the parade at this point, she was the star of the show after all, the animal celebrity of her circus. Eldridge, in an attempt to get her moving again, knocked her right in the area of her abscessed tooth with the bull hook. Of course, this pissed her off. It happened very quickly. She reached up with her trunk, grabbed Eldridge, slammed him to the ground and smashed his brains all over the September Tennessee mud with her tree trunk foot like his head was a grape. The crowd panicked and shrieked like startled chimpanzees. Someone fired five rounds of ammunition from a pistol at her while she stood there in a stupor. Then, because this is Tennessee in 1916, the bloodthirsty mob cried out for an old-fashioned lynching. I probably don’t need to tell you what happens next. They didn’t just come right out and say she should be hanged. The crowd was just vicious. They debated whether or not she should be dismembered alive by locomotive, crushed to death slowly or electrocuted. It was finally arrived at that she should be hung by crane. The crane was in nearby Erwin, Tennessee. Circus goers, who were delighted by the sight of elephants performing tricks, were even more delighted to hear the news that one would be hung by crane later that afternoon. Mary was followed to her execution by four other elephants, holding tails with their trunks. This was done in an effort to keep Mary calm and to provide spectacle. As the chain was put around Mary’s neck, a heartbreaking trumpeting came from the other elephants. To keep her from running away, she was tethered to a rail with a chain. This had the unfortunate effect of breaking her bones as she was she was hoisted up by the crane. A loud snapping noise was heard. She did not die quickly. As she was raised up, her neck broke. She fell to the ground and broke her hip. As she lay on the ground, dazed and in terrible pain, another chain was attached to her. She shrieked and grunted in pain as the audience laughed and cheered. She hung there for thirty minutes, lifeless until declared dead. The circus performed that night. They buried the elephant and the story became local folklore. It seems almost as if it were a lie, like someone made it up somewhere. I would have probably thought so myself if there hadn’t been so much in the way of evidence to back it up. Mary has since become a kind of cult animal celebrity. The story of her tragic killing has been featured in books and plays and documentaries – a martyr of cruelty, like Jumbo, dying for our sins; killed by a combination of dumb circumstance and human ignorance. We admire and stand in awe of these charismatic megafauna, that’s why they have the ability to become famous in our eyes. They display millions of years of specialized evolution in front of our faces. To watch them merely move about is a spectacle in itself. To see how those muscles work and those eyes looking back at you, one can know they are looking back at something that has developed perfectly for its environment. It’s no wonder why they have such ability to attain celebrity. For some, this can be a humbling experience, but for so many whose egos can not take humbling, an emotionally damaged response occurs. They feel the need to dominate it, to conquer, to destroy. That’s where the need to keep these animals in captivity for entertainment and the desire to kill them for trophies comes from. In the next part of this series, I’ll be taking a look at the circus in the modern era and the possibility of finally removing animal acts from them all together. No more dead elephants. No more dead lions. Price, Charles Edwin, and Randy Hodge. The Day They Hung the Elephant. Johnson City, TN: Overmountain, 1992. Print. Next Post Where Do Our Gyms Come From?